From left to right: Ilana Gershon, Carol Greenhouse, Susan Coutin, Barbara Yngvesson, Rachael Styker and Michelle Bigenho. 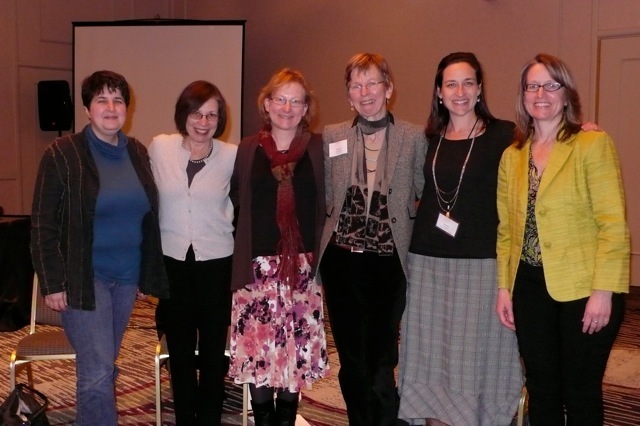 During the joint APLA-AES meetings in Chicago 2013, colleagues, students, and friends of Prof. Barbara Yngvesson celebrated her scholarship, mentorship and friendship with a personal reflection by Carol Greenhouse, and papers by Susan Coutin and Rachael Styker. Below you will find the panel abstract and links to the full papers as well as an introduction by Michelle Bigenho and Ilana Feldman. Enjoy! This panel celebrated the work of Barbara Yngvesson in marking her retirement from Hampshire College, an institution at which she was a founding faculty member. Yngvesson’s scholarly work consistently explores the social effects legal frameworks produce. Her close ethnographic analysis examines different forms of cultural subjectivity in transnational adoption, US lower courts, and other sites. Yngvesson is a scholar who clears paths for the rest of us, who finds a research question or object of study that awakens people to new possibilities. As she has turned to law, psychology, and politics to explain the social phenomena encountered in her fieldwork, the interdisciplinarity that characterizes her work has transformed intellectual conversations. Her consistent openness to alternative approaches marks both her intellectual inquiry and her authorial practices. She has co-authored with, among others, Susan Coutin, David M. Engel, Carol Greenhouse, Maureen Mahoney, and Bill Maurer. To date, her distinctive theoretical insights grace multiple stand-alone articles and two books, Virtuous Citizens, Disruptive Subjects: Order and Complaint in a New England Court, and her more recent, Belonging in an Adopted World: Race, Identity, and Transnational Adoption. At this panel we honored Barbara Yngvesson’s elegant transformations of legal anthropology’s terms of engagement. The papers on this panel engage specific points of Yngvesson’s work, present work inspired by her creative theoretical applications, and reflect on her mentoring roles.